Not long ago, I was approached by one of my students at Northwestern, who was distraught over a situation in a fledging company that she had started in my entrepreneurship class. Her group had decided to split the equity in her company equally – 25 percent each. Now that the class was over, the other three partners weren’t pulling their weight. Two of them were pretty much out of the picture, and the third was only doing a little. However, all of them wanted to keep their share of the equity or sell it at an unreasonable price. The student was on the edge of tears. She didn’t know what to do. She found herself a minority shareholder in a company that she had dreamed about starting for several years. Now it seemed that the idea was going to die on the vine. I wish this was the only time I’d heard this story, but it’s not. It happens all the time. 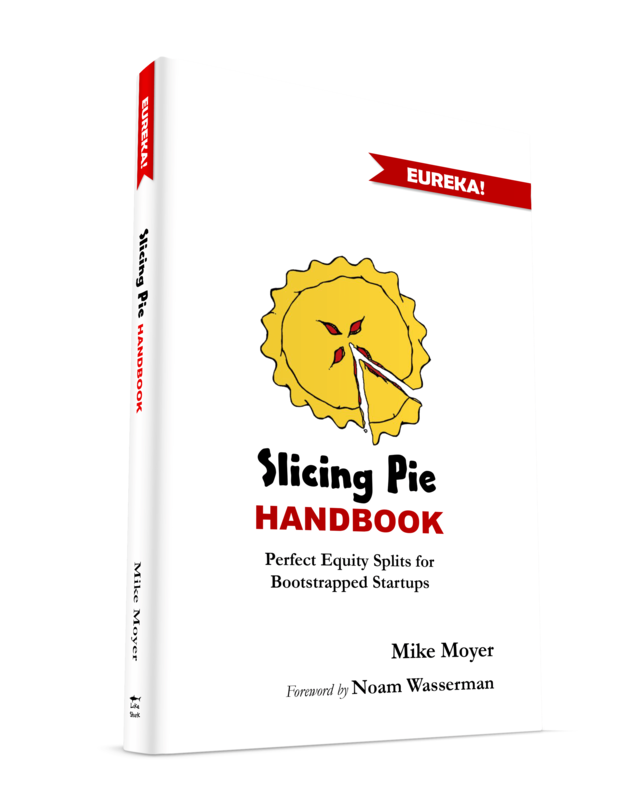 In spite of an overwhelming number of books offering advice to entrepreneurs, there are surprisingly few about how to properly divide up the startup equity pie to avoid situations like my students’. The last time I counted, the number was zero. So I wrote one, called Slicing Pie, which as far as I know is the only book on the subject that exists. Because there have been no good resources, many entrepreneurs make the mistake of calling a lawyer or an accountant to help them solve the problem. These people aren’t free, and the money spent is money that could have otherwise been used for marketing, product development, or anything else that helps a company grow. Lawyers and accountants (as much as I love them) don’t really help young companies grow. The problem with equity in early-stage companies is that it is worthless. So folks spend a lot of money legally protecting a worthless asset. The time to hire the lawyers and accountants is when you actually have built something of value. In the early stages, we don’t need legal protection; we need moral protection. We need a basic understanding of what’s right and wrong when it comes to treating people fairly for their contributions to a startup company. In my example above, the deadbeat partners may have a legal right to the equity they were granted, but something doesn’t seem quite fair. Fairness starts with laying out the rules and agreeing to follow them. This means that we need to allocate equity based on a set of rules. There are two mistakes made when allocating equity. The first is to divide the pie before you build the company. This is quite common, and founders often wind up where my hapless student did. The other mistake is dividing up the pie after you build the company, which often leads to internal battles that can cripple a startup team. In reality, startup companies change rapidly. Founders, employees, and partners come and go. The right rules, therefore, should lay the groundwork for allocating equity on a rolling basis based on the relative value of the contributions of the participants. The model, called a Grunt Fund, allocates equity based on a participant’s percentage of the total value (which, by the way, is completely theoretical; the company is still worthless at this point). There are different types of contributions people can make to the company. Time, of course, is the most common. Others include money, intellectual property, supplies, equipment, professional services, relationships, and other resources. All of these things are important ingredients to baking your pie, and they all have a value relative to one another. Your time, for instance, has a value that may be worth more or less than the time of someone else working for your company. Likewise, $1,000 cash has a value that may be worth more or less than the $1,000 worth of Twinkies provided by one of the founders for your snack room. Each input, large and small, has a value. To make your equity program work, all you need to do is agree how to calculate the values and keep track of where they came from. Easy as pie. But what if someone leaves? Investors generally don’t like a bunch of absentee owners, so you will have to have a set of rules that govern the allocation of equity when someone leaves the company. However, the circumstances under which someone leaves are relevant to the discussion. For example, if you asked someone to leave, they should have a different expectation regarding their equity than if they decided to leave themselves. In the first example, they were pushed out or fired; in the second example, they left you in the lurch. You need rules for this, too. In the Grunt Fund, how someone leaves a company will determine what they get to keep and what they have to give up. Treatment of a departing team member sends a powerful message to the other team members. If you mistreat someone on the way out the door, you can lose the respect of those who stay behind. Slicing Pie is a moral contract between you and your fellow entrepreneurs. It’s not a legal contract. Just because you can do something legally doesn’t make it right. Startups are about trust and doing the right thing for those who help you succeed. If you have to start your relationship with a legal contract, you probably picked the wrong partners.